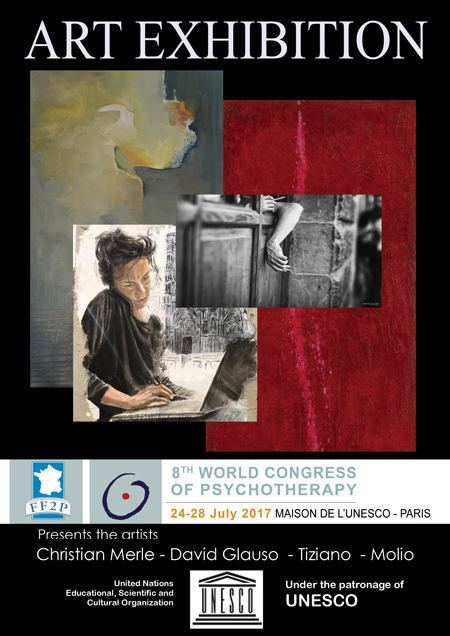 The FF2P was created in May 1995 to bring together the different psychotherapeutic and psychoanalytic fields in France. psychoanalytic, humanistic, cognitive-behavioral, systemic and integrative. The FF2P’s mission is not only to promote psychotherapy as a specific discipline, but also to contribute to public information and protection of users. This ethical and deontological imperative is at the heart of the action of the FF2P and all its audience. All associations of the categories mentioned above and training organizations approved by the FF2P meet these criteria. The FF2P is a member of both the European Association for Psychotherapy (EAP) which collects 120,000 practitioners in 41 countries and the World Council of Psychotherapy (WCP). The FF2P is the only organization in France authorized to issue the European Certificate of Psychotherapy (CEP) *. *The CEP, established by the EAP in 1997, aims to establish strict criteria for the practice of psychotherapy and to establish a high level of training. A pioneer in many fields, the French League for Mental Hygiene, recognized as having public interest in 1922, became the French League for Mental Health in 1996. - Providing assistance to psychologically fragile individuals to avoid shifting to larger problems. This quote by Eugene Minkowski, founder of the association originally dedicated to his wife Françoise Minkowska, summarizes better than anything else, the life and work of the author. A well-recognized physician and philosopher, he spent his whole trying to better understand the individual in his uniqueness and in his entirety to better treat him. In continuation of his work and thought, the association is committed to caring, teaching, training and exchanging knowledge. It is in this spirit that the Françoise Minkowska Center was born in 1962. This state establishment, created to ensure the reception of all migrants and refugees in need of mental health care, has not deviated from that goal in over fifty years of activity and is now recognized both nationally and internationally. The Françoise Minkowska Center provides transcultural psychiatric consultations centered on the person. He introduced to France the concept of cultural competence. 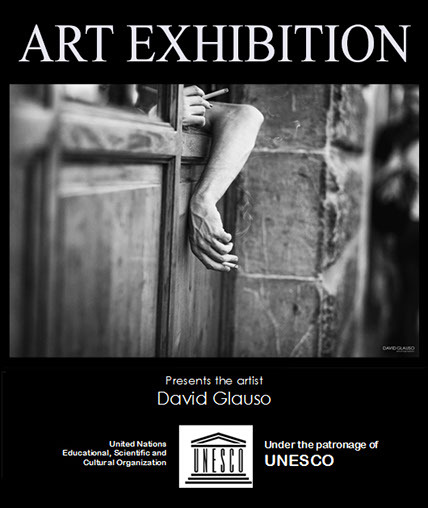 David GLAUSO, born in Florence in 1971, showed from his childhood an inclination for art, drawing and sculpture. At the age of 6 he was already drawing in 3 dimensions and at 10 years old he started being passionate about photography with his first analog Reflex, a Fujica STX-1. He undertakes technical studies and continues to develop his artistic gifts in photography. In 2000 he started his professional activity as a software developer and web designer. Then, driven by passion, in 2011 he makes photography his main professional and artistic activity. For a whole year he wanted to experience street photography by passionately depicting his city, Florence, through photos capturing everyday life moments. Moved by a deep desire to meet people as a personal introspection, David Glauso sharpens his photographic composition by creating his own style which will become a stylistic figure. His photographs tell the simplicity that characterizes everyday life and highlight the elegance of each person encountered. At the end of 2012, he buys a more high-performance camera, a Canon 5d marks III, and renews its optics. Fixed lenses are the ones he prefers because they allow him to take high quality photographs. His photography is born through the observation of the everyday life and the desire to tell a story. In 2013 David Glauso offers his services as a professional photographer for corporate and private reports, weddings and portraits. Black and white and movement are its force of expression. His photographs come from the search for the exceptional in the scenes of everyday life. He chooses black and white as an expressive form to highlight the scene. He removes the color to exalt the essence of the moment and gives at the movement an appearance that is natural and recognizable by any spectator of the piece of art. 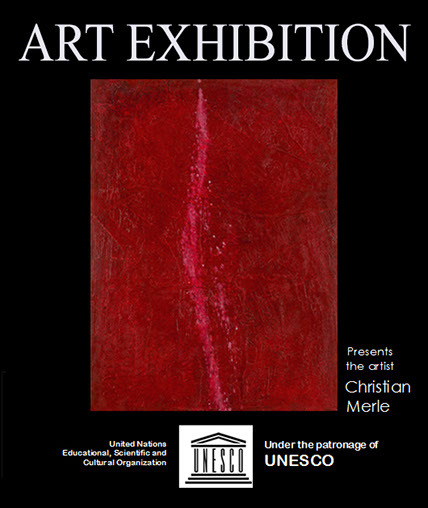 Christian Merle, began his work as a painter throughout several internships at the Abbey of Ligugé (Vienna) with Benjamin Leyton Flores; Exhibitions at the “Couleurs du Temps” (Poitiers), “Rencontres des Arts de Thévet Saint Julien” (Indre), “Unversité 2000 Nantes”, Library of “La Rochelle”, Library of the “Formation Permanente de l’Université de Nantes”. "As music is the distillation of silence, painting is the epiphany of the invisible. Out of sudden, something happens, it is a very strong moment of unity and manifestation of the deep reality." Painting caught my attention from childhood. Since 2015, I am fully devoted to it. However, I never stopped to paint in my free time and therefore I was able to constitute various collections over my imagination, by interpreting the things of this world according to the game of the unconscious / conscious. From this vision of the past from which flows the future, the Wagner and Mineral collections appear as a turning towards the abstraction. Without prior conceptualization of shapes, the collections are created from colors posed on canvas and spontaneous gestures over music or natural elements. There was already a primer of this in the collection Encounter with Self and forgetfulness of self and partially in Emoi / Cosmos. Nature and music always remain a source of inspiration. Living by the water in the South of France, i will "fish" regularly every day the flashes of light that the water addresses me, so different from season to season. They are limitless. I then tend to push them to the maximum of their luminous or dark beauty in my abstract or figurative mineral creations. A certain strength, silence and a poetic vibration is released. Born in 1962 in Gandia, Valencia, Spain. Molió painted from childhood, attracted by the light coming out from Joaquin Sorolla’s paintings. She paints trees, waves...her brushes are seaweed, pieces of wood, pebbles...between shells and fields of oranges. Molió painted her first oils at the age of 10 by observing the painter the her family hosted in the summer. In 1975, Franco did not exist any more. After this great silence, the Movida invades Spain. In this exuberance, Molió studies the Graphic Arts and joins an architecture workshop in Gandia. In 1983, eager for knowledge, she leaves for London. She goes from museum to museum, from emotion to emotion, she does not stop to rediscover Turner, Van Gogh, Velázquez. She is stunned by on of the versions of the Scream of Munch. In 1986, Molió settled in Saint-Malo, studied French, joined the Academy of Plastic Arts and joined a Superior School of Commerce in Lorient. She discovers the fascinating Route of the painters of Cornwall. At the end of her studies, her professional activity leads her between France and Spain. Again, she visits as more as she cans the museums of Paris, Barcelona, Madrid, Bilbao. In 1994, Molió set herself up in Saint-Malo, and in 2002 she created her company of interior decoration. Her numerous achievements are put in use: calligraphy, plans, sections, perspectives, colors, materials, anatomy, architecture, oriental arts. At the same time, Molió is regularly engaged in painting. From 2003 to 2005, she produced 60 paintings, entitled Meeting with Self and forgetting oneself. The Regional Council of Brittany contacts her and offers her a personal exhibition on the occasion of the inauguration of the “Village des Artistes” in 2005 at the Fort of Saint Père near Saint Malo in Brittany. The success was significant. A great future was ahead. As a result of this event, Paul Aïzpiri invites her to his studio in Paris from 2005 until the disappearance of the “Maître” in 2016. She is invited to the Festival of Cinema of “La Ciotat” for an exhibition in 2006, she discovers the Côte d'Azur and then she settles there two years later. In 2007, her work Chassé-croisé was selected and bought in an international competition launched by the Château des Réaux (Chouzé-sur-Loire, in the Center-Loire Valley region). By the end of 2014, Molió, free of various constraints, could fully devote herself to her art. She does a group exhibition in Saint-Germain-des-Prés in the gallery “Etienne de Causans” during the “Sam Paris” in the fall of 2014. 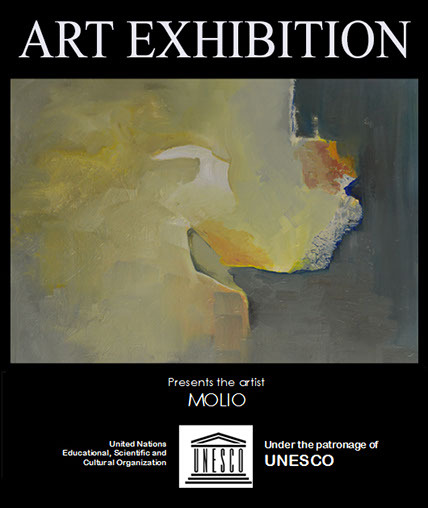 In 2015 Molio exhibited in Brussels at the “Espace Art Gallery”. 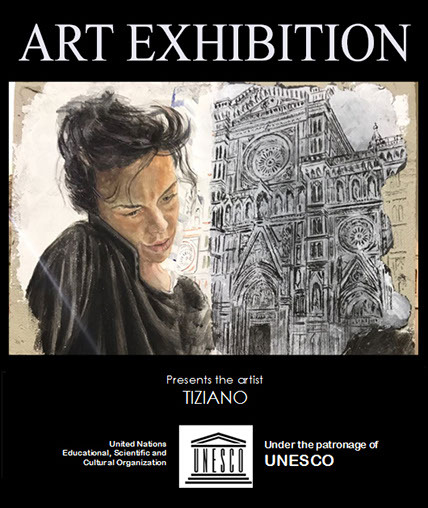 In March 2016 the artist exhibited at the “Château de Solliès-Pont” and in December she exhibited at the “Espace Jules de Greling” at Brusc, in the Var. Thorough knowledge of ancient techniques of mural painting and organic supports, as described in the best-known artistic manuscripts. • Restorer of wall paintings since 2000 with participation in interventions of particular historical and artistic interest (again, see Professional experience). Since 1995, independent realization of more than 150 murals in fresco and dry, commissioned by public and private customers, for a total surface of about 3500 square meters, including, the exterior structure of a medieval monastery, a town hall, facades of historic centers and many interiors of villas, hotels and cafes. • My own painting is also based on the use of mineral materials adapted to the technique of frescoes, adopting methods and recipes that are both ancient and contemporary. This allows me to promote a pictorial-figurative and technical-material art that I have exhibited in numerous exhibitions and public events. Personal exhibitions in 2005, 2006, 2007 (a catalog of my works was released in 2008). Trompe l'oeil, grotesque, ambient decorations, false walking surfaces with mortar, false plaster surfaces, false soap marble, etc. I have worked and continue to experiment with all the painting techniques of ancient civilizations charting their evolution through the centuries.